Produced by: Fearghus Ó Conchúr in association with Project Arts Centre and with the support of Dublin City Council and An Chomhairle Ealaíon/The Arts Council of Ireland. On wasteground near Sherrif Street, in Dublin’s Docklands, a cast of international dancers embody the spirit of a city whose skyline changed everyday during Ireland’s economic boom. They dance under the cranes, shelter in derelict factories and celebrate on the overgrown plots of land that await the developers’ attention. Like Dubliners new and old, they adapt to changed circumstances in a choreography that is as tough, quirky and unexpectedly beautiful as the city itself. They make the most of what they have. 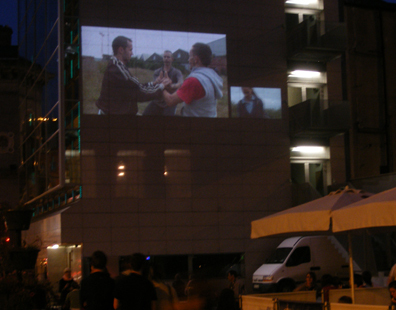 Three+1 for now has its public premiere on Culture Night 2007 when it was projected onto the side of the Dublin City Council buildings at Barnardo Square near City Hall. It has been shown as part of the Screendance Festival in Falkirk in May 2009 and as part of Dublin Dance Festival’s screenings at the Lighthouse Cinema in July 2009.